We had an incredible time during our two week stay in Costa Rica, traversing across the country in search of adventure, rafting the wild jungle rivers, hiking volcanoes and rappelling down waterfalls. But sadly the time had come to return back home. As the feelings of post trip blues already started creeping into my thoughts, my boyfriend K reminded me that we weren’t quit done yet. We had booked one of our flights on points and by doing so, had ended up with a long travel time home making not one but two stops. What some people might have considered a hassle, we looked at as an opportunity for one last adventure. You see, we had a 10 hr lay over (in the middle of the night) at the Newark Airport in New Jersey, before catching a short flight home to Ottawa, Canada. Arriving in Newark around 11:30 pm, with our next flight not departing until the following morning at 9:30 am, we made the executive decision to forgo booking a hotel room or camping out on lounge chairs in the airport, and decided to catch a bus into New York City instead. 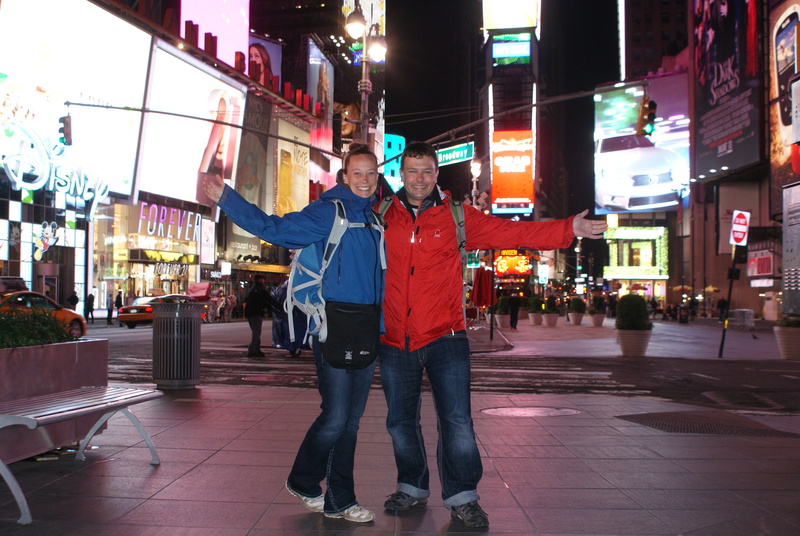 Neither of us had ever been and we were excited to explore the city that never sleeps. So after arriving in Newark, we grabbed our carry on bags (our baggage being checked all the way through) and jumped on a bus bound for Times Square. It only took 30 min and then there we were, standing amid the bright lights, the glitz and the glamour of one of the most famous cities in the world! We fueled up on coffee at Starbucks and set out on our own free walking tour in the heart of Manhattan. Macy’s, Rockefeller Center, Madison Square Garden, Radio City Music Hall, Broadway, The Empire State building, we saw it all. We wandered the streets for hours, excited and delighted when we came across yet another world famous landmark in this world famous city. Stopping for a hot dog at a street vendor and munching on some French fries at a local diner we felt like we were getting the real New York experience. While everything was closed and we didn’t get to go up the Empire State building, it was still a wonderful venture that I will never forget. By the time we returned to the Newark airport, went through security and were waiting by our gate, I was so exhausted (but smiling!) that I was actually looking forward to returning home and most importantly, my own bed for some much needed sleep.